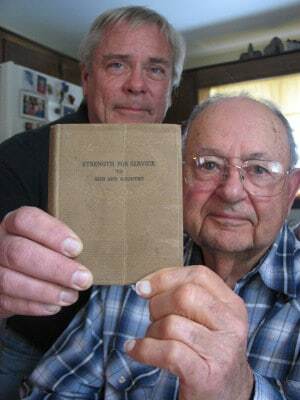 VINTON, Iowa – A copy of Strength of Service to God and Country was presented to Roy Krug of Dysart, Iowa, on Dec. 25, 1944 -Christmas Day – as Roy, 33, was to head off to war. Roy, who also served on the Vinton Police Department for 11 years, died Oct. 27, 1977. His widow, Ruby, died some time after that. The book somehow wound up at an auction, possibly in Independence. Gary Johnson of Peosta, Iowa, bought the book. Gary, a retired telephone technician who served aboard the USS Bristol in the mid-1960s, knew Roy – or a relative – would like to have the book. A call to Eva Krug in Dysart led Gary to Glenn Krug, a nephew of Roy. That would have been 1938. Roy later worked for a dairy, went into the service and worked at the ham processing plant in Vinton before becoming a policeman. While Glenn doesn’t recall that Roy was religious, he knows his father walked to church every Sunday. “I think it was rather ironic that Uncle Roy had this,” Glenn says. This article is based on a report from Dave Rasdal, a reporter for the Eastern Iowa Life. Gary Johnson (left) presents a copy of Strength for Service to God and Country to Glenn Krug, a nephew of the deceased World War II veteran who once owned the book. (Photo by Eastern Iowa Life).